In 1938, after the Kristallnacht pogroms in Germany, where rampaging Nazis assaulted thousands of Jews, ransacked synagogues, and wrecked thousands of businesses, a poll revealed that almost 70 percent of students in colleges and universities in the United States opposed offering their country as a haven for Jewish refugees in Central Europe. This response, according to Stephen Norwood, a professor of history and Judaic studies at the University of Oklahoma, was symptomatic of the callous indifference among America’s college administrators, students, and faculty to the plight of German Jews throughout the 1930s. 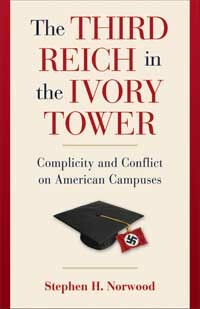 In “The Third Reich in the Ivory Tower,’’ Norwood draws on incidents at Harvard, Columbia, the Seven Sisters women’s colleges, state universities, and Catholic institutions to excoriate the nation’s educational elite for its “truly shameful’’ appeasement of Hitler’s Germany and for suppressing protests against fascist atrocities. When Nazis burned 20,000 Jewish and other “un-German’’ books in 1933, Norwood points out, college and university officials remained silent. Or worse. Although he had led a campaign to rebuild the library at the University of Louvain in Belgium after it was burned during World War I, Nicholas Murray Butler, the president of Columbia University, did not join efforts to establish an American Library of Nazi Banned Books. Butler expelled Robert Burke, a student leader of a mock book burning on campus. And he approved the decision of the chairman of the art history department not to reappoint Jerome Klein, a popular instructor, two months after Klein circulated a petition protesting a visit to Columbia by Hans Luther, Germany’s ambassador to the United States.